It's a common misconception that visitors to Africa are constantly at risk of attack from the continent's wildlife. In reality, iconic species like the lion, buffalo and hippopotamus are confined to Africa's game reserves, and if you follow basic safety guidelines, they pose little threat to your safety. In fact, most of the species on this list are currently classified as either vulnerable or threatened and have far more to fear from humans than we do from them. With that being said, it's good to be aware of Africa's so-called dangerous species, so that you can avoid any negative interactions by treating them with the respect they deserve. Man-eating lions like the ones who famously killed over 100 men working on a railway in Kenya's Tsavo region in 1896 have given the species a fearsome reputation. It is thought that sick or elderly lions who are no longer able to hunt stronger prey may turn to humans as a source of easy food, killing an estimated 250 people per year in Africa. Opportunistic attacks may also occur in areas where the lions' natural prey has been depleted. However, under normal circumstances, lions do not usually target humans. Both the white and black rhino will charge when threatened, and both have been responsible for a number of human deaths. However, of the two species, the black rhino is traditionally considered the most aggressive. They will charge readily at any perceived threat, have two sharp horns and can reach speeds of up to 55 km/ph. The largest male on record weighed in at over 6,380 lb/ 2,890 kg. However, black rhinos are right to be wary of humans - as a result of drastic poaching throughout their range, they are now considered critically endangered. As the largest living terrestrial mammal, the African bush elephant can be an intimidating sight. Estimates suggest that elephants are responsible for the deaths of around 500 people every year (while approximately 55 African elephants are killed every day by poachers). Most attacks are carried out by bull elephants in musth, a period of sexual activity during which their testosterone levels increase dramatically. At this time, male elephants are particularly aggressive, often attempting to trample any animal that comes too close. Nile crocodiles are Africa's largest freshwater predators. They have armored skin, razor sharp teeth and an impressive bite force. Known for their ambush tactics, they are indiscriminate hunters and may attack any animal that comes within reach - including people. Although the number of unreported attacks makes it difficult to determine the exact statistics, it is thought that Nile crocodiles kill hundreds of humans every year. Victims are either drowned or torn apart, and are often stashed for later beneath submerged rocks or branches. The black mamba is the largest and most feared of Africa's venomous snake species. They grow up to 8.2 feet/ 2.5 meters in length and are notoriously aggressive when cornered. Thought to be the fastest of all African snakes, they usually strike repeatedly, releasing a neurotoxic venom into the victim's bloodstream. This venom is strong enough to cause a human to collapse in 45 minutes, and if the bite is left untreated, will kill almost 100% of victims in as little as seven hours. Symptoms include asphyxiation and cardiovascular collapse. The Cape buffalo is renowned for its aggressive, unpredictable nature, and is thought to have killed more big game hunters than any other African species. They are known for their tendency to circle back on their victims, and will either trample them to death or gore them using their impressive set of fused bone horns. It is estimated that Cape buffalo kill around 200 people every year. They typically live in herds that can vary greatly in size, and work together to eliminate a perceived threat. Bull savannah buffalos can weigh up to 2,200 lb/ 1,000 kg. Despite being vegetarian, hippos are considered the most dangerous terrestrial animal on the African continent. On average, they are responsible for the deaths of almost 3,000 humans every year. Male hippos are exceptionally territorial and will actively defend their section of river or lake from perceived intruders. Females will attack any animal that comes between them and their offspring. Hippos can run at speeds of over 30 km/ph on land, and may weigh over 3,300 lb/ 1,500 kg. A male hippo's canine teeth can exceed 20"/ 50 cm. The puff adder is not the most venomous African snake species, yet it is thought to be responsible for the most human fatalities. There are several reasons for this, including the snake's wide distribution, its prevalence in areas populated by people and the fact that it relies on its camouflage to avoid detection. This means that instead of fleeing from approaching danger, it lies still. Most attacks occur when people accidentally step on the snake. The mortality rate is relatively low, with most deaths happening as a result of poor treatment. 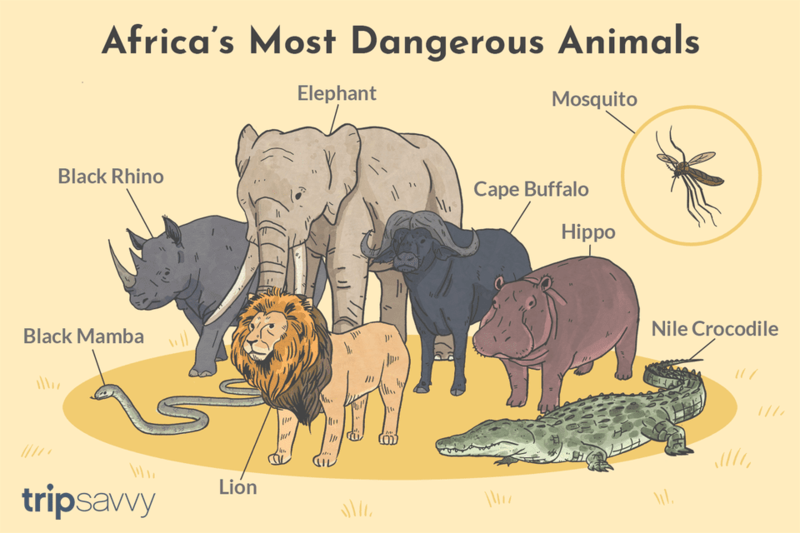 Of all the animals on this list (except for the mosquito), man is by far the most dangerous. In South Africa alone, an average of 50 people are murdered every day. War, genocide and tribal conflicts also add to the death toll throughout the continent, with some of the most famous examples including the Rwandan genocide of 1994 and the ongoing conflict in Darfur. The Second Congo War claimed the lives of around 5.4 million people (many of them as a result of disease and starvation) making it the world's deadliest conflict since WWII. Africa's single biggest killer is the mosquito. Different genuses carry different diseases, including potentially fatal illnesses like yellow fever, Zika virus, West Nile virus, dengue fever and malaria. In 2016, 445,000 people were killed worldwide by malaria, 91% of them in Africa. All forms of malarial parasite are transmitted by the female Anopheles mosquito, including P. falciparum. Often called cerebral malaria, this form of the disease is particularly dangerous and accounts for the vast majority of malaria-related deaths.